One day last week, with a hunger in our bellies, we set off for Bumrungrad. 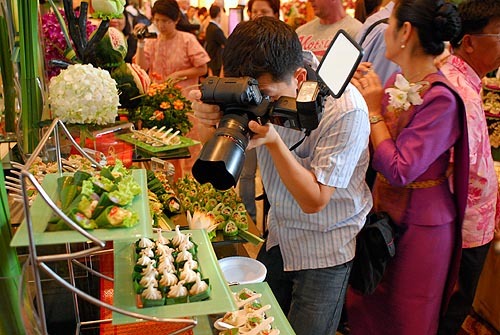 The hospital, a popular medical tourism destination, sponsored a celebration of healthy foods under the title, “World Famous Flavors of Thailand.” By its own accounts, some 500,000 foreign patient/tourists check into the hospital each year. (Medical tourism is a big, booming industry for Asia’s more developed cities.) The Bumrungrad PR department wants to get the word out: they don’t serve any old hospital food. 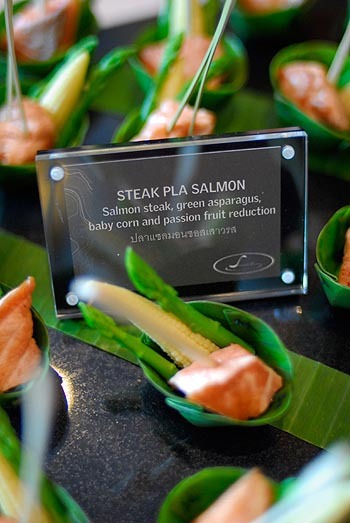 They serve upscale, beautiful and healthy delights created by some of the city’s best restaurant chefs. So off we went, to check out the goodies. 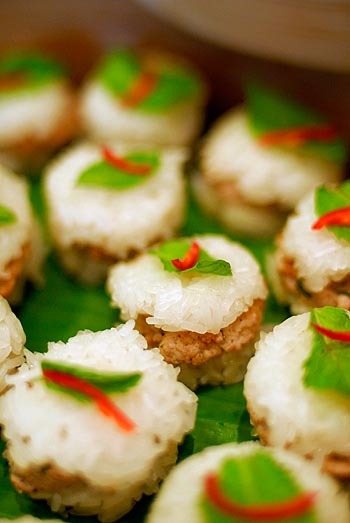 What you see above are teensy-weensy laap burgers on a bun of sticky rice, topped with mint and chile. The entire Bumrungrad lobby was stuffed with activity. Swarms of people ogling exquisite arrays of miniature foods. 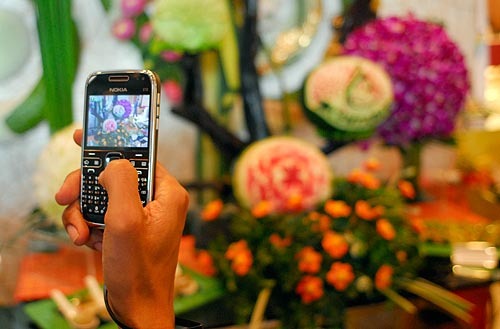 Big lenses, tiny phones—everywhere people jostled for a look and a sniff. 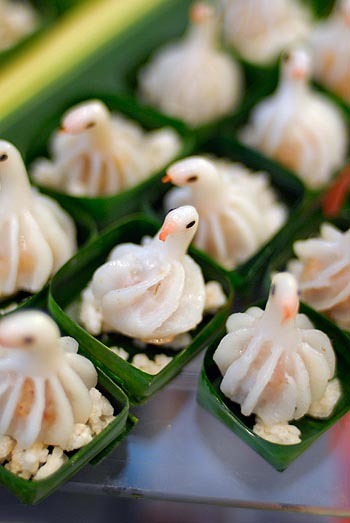 There were steamed rice crepes with herbs and minced chicken, shaped like little birds. 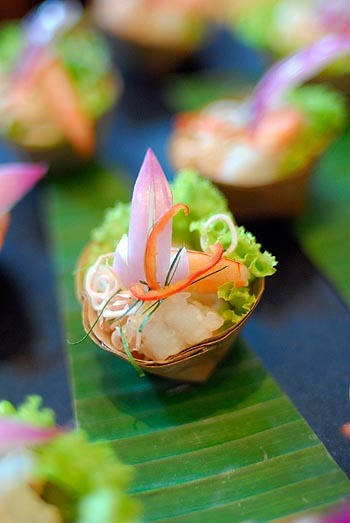 Cucumbers carved into minuscule baskets; vegetables made to look like oysters holding healthy Thai herbal mousse. Rice crackers topped with green curried beef, strawberries wrapped in betel leaves. 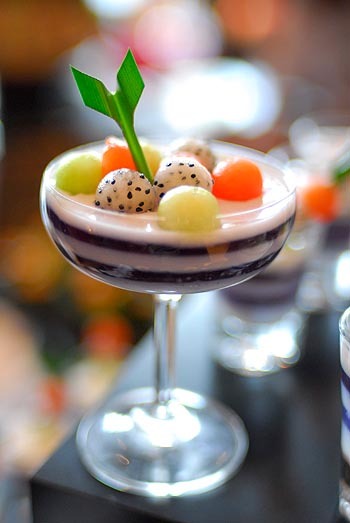 Sausage burgers (not sure how healthy those were), salmon steak, and the most brilliant purple anchan flowers (butterfly pea) with coconut jelly and fresh fruit balls. Job’s tears in coconut milk, little paper-wrapped cones of yam nua yang. Traditional Thai jingles played in the background, and a roving puppet kissed visitors on the cheek. So much food, so much commotion. How did it all taste? I have no freakin’ idea. We left more than an hour later, tummies rumbling. All these artistic edibles, and not a single thing was available to eat. It was all for show until after 3 p.m., long after our appetites grew impatient. So we escaped to a Bangladeshi restaurant up the street and tanked up on curry. 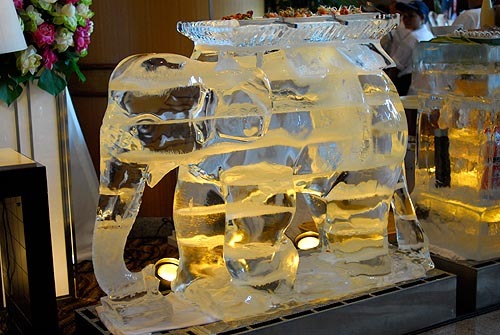 Gorgeous food – I can’t believe they didn’t let you eat any of it! My Mother lived in Bangkok for ten years (she just returned), and once when I was visiting her I woke up with the flu and went to Bumrungrad to see a Doctor. The Dr. spent an hour with me, which I found remarkable (and he was really nice). Biggest plus, the nurses wore clothes from the fifties. The dresses, and white hose and lace up shoes and the charming wimple- like hats. I felt like I was in an episode of Marcus Welby. Wow! I can’t believe they serve that as hospital food…although maybe they don’t since they wouldn’t let you try any! Akila, thankfully it’s easy to find food this pretty in Thailand! eleise, I’ve never been treated at Bumrungrad, but I have visited other Thai hospitals and have always been impressed by their speed and personal attention. In two hours, a walk-in patient can be seen by a doctor, have xrays taken, see the results, get proper prescriptions and physical therapy. Amazing. I think not allowing you to sample that food almost counts as cruel and unusual punishment! 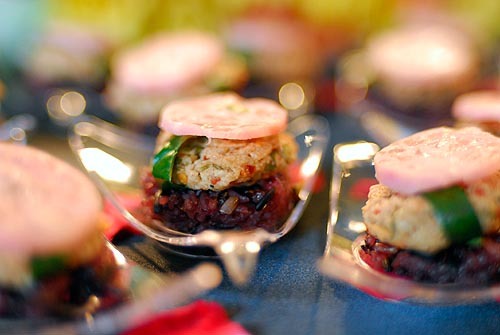 I loved the idea of a laap mini-burger. We have always said that if we have to be sick and in a hospital, Thailand is the place to be. After seeing this, I’m convinced. 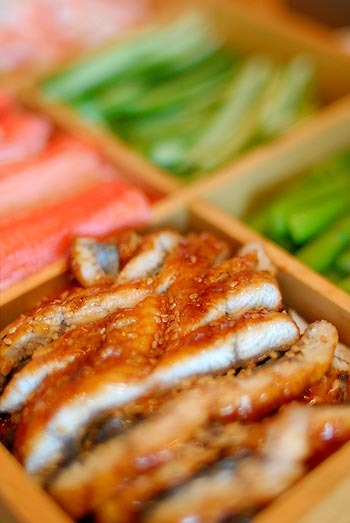 Audrey, great food is found in some of Asia’s most unlikely places — hospitals, airports, bus stations. And malls. Can’t forget the fabulous mall food. Beautiful pictures of the event, thank you very much! Your pictures brought out the best of the day, I almost can not believe it myself (I work at the hospital). But Karen, it actually was not for show! Every singly bit of it was eaten by patients and visitors. Unfortunately, the eating did not start until 3:00 after the puppet show and the speeches. It must have been right after you left! Apologies for that. Thanks for your note. Yes, we left at the end of the speeches, apparently before the real indulgence began. Our stomachs gave in. Ah, well, next time! No apology necessary. This food is beautiful. I guess in these hospitals where medical tourism is really popular, the hospital isn’t a place for the injured, sick or dying. It’s full of people with money and they will absolutely appreciate these exotic flavours.